• Gold shares were expected to decline with the financial markets into dislocating conditions expected to culminate in November. • Gold's nominal price in dollars was likely to decline as most of the panics would occur with the dollar rising against most other currencies and most commodities. • This was based upon the course of significant events though previous great bubbles and their consequent contractions. 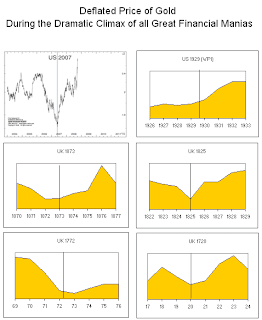 The following page of charts shows the pattern for gold's real price through the biggest manias, including the first one in 1720. Within this, the gold premium which was at 118 in August 1873 fell to 106 as the crash ended in that November. • Typically, gold's real price declines through a financial mania, and just as typically gold shares underperform the stock market. • Typically, gold's real price increases during the economic and financial contraction that is consequent to a bubble. • More specifically, we used the behavior of the yield curve and credit spreads through the 1929 and 1873 manias as a model for the path that would define the eventual collapse of our bubble. This expected that the key reversal to adversity would occur close to June 2007. The reversal in the yield curve was accomplished in that May and spreads reversed in that fateful June. • Of interest is that the real price of gold, as represented by our Gold/Commodities Index, reached a high of 255 in June 2003. Then as that boom launched, the index began a cyclical decline, which reflected diminishing profitability for gold producers. Rising commodities relative to gold reflects basic mining costs rising relative to bullion sales. • The most reliable indicator of the end of a mania has been the change in the yield curve. It was significant that this was also the cyclical low for our index at 143 in May 2007. With November's panic, it increased to a high of 339. We thought that this measure of gold would double on its cyclical bull market, which has further to run. • This has been indicating that operating costs have been falling relative to the price of gold and it should soon begin to drive earnings up, as earnings for most sectors remain under the pressure of falling prices. • The rise in the real price also increases the valuation of gold deposits. • Although gold is an essential part of the yield curve, no traditional supply/demand research on gold has ever anticipated the beginning of a classic financial contraction. • Mainly, conventional analysis seems to be tedious gossip about what central banks are doing with their reserves, what's happening with the Souks, Indian wedding seasons and the monsoons. Marketing and treasury departments at big mining companies turn gossip into reports so that the CEO can appear to be well-informed to the board of directors and the media. • Equally tedious has been all the finger-pointing about "conspiracies" as an explanation about why gold and silver are not conforming to the dictates of traditional fundamental analysis. • For two decades the World Gold Council has focused upon jewellery consumption as the key to gold's price trends. Indeed, such demand grew strongly during this, as well as the new financial era that blew out in 1929. Interestingly, this consumption was essentially overwhelmed by the decline in investment demand that is one of the features of a financial mania. Producers suffered poor operating margins. The real price typically declines and then with some irony the wonderful demand for jewellery slumps as the real price goes up in a crash. The point being is that in the real world analysis of jewellery consumption can be misleading - especially during a financial mania and its consequence. • Then there is macroeconomic research. This uses hundreds of Fourier equations to project gold prices, which seems to go over well with the treasury departments of the big mining companies. The more popular services will provide three price forecasts. One is a moderately rising trend line, another rises less steeply, and the third declines. This saves both modeler and subscriber from making a judgment call. Moreover, the accounting departments don't so much care whether the method is reliable. Any price will do, so long as it is for the year-end. • Gold shares had been likely to decline as part of the typical fall crash, which would likely clear around mid November, and our advice since late October has been to cover shorts in silver stocks and to get long the gold sector. • A new bull market for gold shares has been expected to start in November and run for a few years. • This has been expected to encompass the whole gold sector, including exploration stocks. • Based upon previous post-bubble contractions, this could run for around 20 years. Of course, the usual business cycle would prevail, with the gold sector doing well on the recessions. • Beyond being something to trade, the gold/silver ratio has been a reliable indicator of credit conditions. It declines during a boom and does its greatest service when it typically signals the contraction by increasing. The key move in 2008 occurred with the turn up in May from 46. This was with the reversal in the credit markets and the technical break out at 54 in August anticipated the fall disaster. Often during the more acute phase of a panic, silver can dramatically plunge relative to gold. • With the break above 54 our target on the full contraction became around 100. That level for the ratio was reached with the banking crisis that ended in late 1990, when the last of the 1980 adventures in crude, gold, silver and real estate were finally written off. • From a high close of 84 on October 28 with that panic the ratio declined to 71 with the stock market rebound to November 5. The next rise with the next panic was to 83.5 on Friday, November 21, and the ratio can decline for a few months as the financial markets recover in the first quarter. One of the most fascinating aspects of great credit manias is that all six since 1720 have occurred with a senior central bank with the dangerous prerogative of issue. Each bubble was identified by the street as such until our era of asset inflations. Perhaps our financial establishment has been so ignorant of the dynamics of a mania they were unable to make the call in real time. So despite the inability of our policymakers to forecast another financial disaster such as initially discovered last January, confidence remained that a full-out panic could be prevented. The fall crash was remarkably similar to it counterparts in 1929 and 1873. Historically, at the peak of each mania the establishment took credit for the prosperity, and then found scapegoats in the bust. The mechanism seems to be at the boom the central banks seem to be in control, but the truth is that once prices of the speculative games turn down, power is immediately shifted to Mister Margin. In past examples, this overwhelmed policymakers and continued until the contraction ran its course. The notion that "liquidity" was driving prices up was dead wrong, as soaring prices fostered the most aggressive experiment in leverage in history. And as much of this involved being long the hot items against cheap money in dollar and yen terms is was natural that as forced liquidation started it would be accompanied by a rising dollar and yen. Typically, one of the features of a post-bubble contraction has been the senior currency becoming strong relative to most commodities, and currencies for most of the time. This seems due to the flight to the unique liquidity found in treasury bills in the senior currency as well as in gold. This has been working out. In so many words, the investment demand for gold has been soaring as the wildest creation of credit in history has been contacting. Once a mania is over traditional liquidity always disappears and the role of a rising real price of gold seems designed to increase production, which eventually increases real liquidity in the global financial system. Our review covers three hundred years of history and while there is no guarantee that the pattern will continue to work out, there is no guarantee that it won't. It is appropriate to be fully positioned for a great bull market in the gold sector. • The basic theme has been down in a boom and up in a bust. • Typically, the post-bubble bull market can run for 3 or 4 years. • Typically, this has been within a 20-year bull market. • Historically, we have used the CPI as recorded in the senior currency. • For convenience, we currently use our Gold/Commodities Index.